The first days of July always bring back memories of the days of first days of summer vacations. School was out at the end of June and suddenly two full months of summer laziness would begin. Waking up in a summer cottage and having a full day of tranquility ahead of me. The only must was a trip to the bakery to get a couple of loaves of warm, crusty bread - of which one would disappear before we made it back to the cottage. Swims in the lake, sunbathing on an old wooden lounge chair, afternoons with a book, and definitely picking a few jars of fresh blueberries. That was called a real summer vacation! Berries are definitely my favorite type of fruit, that can serve as breakfast, lunch, quick snack or dinner. The dishes are usually not too complicated - simply add some berries to rice, cottage cheese, oatmeal and there you have it - full of valuable nutritious juicyness, that has summer written all over it. 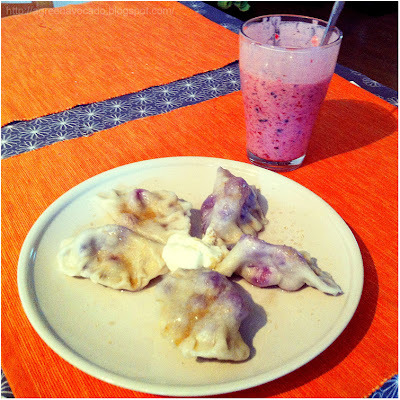 So it's really no wonder that I also like blueberry pierogi, a very Polish dish, although a bit more time consuming, but definitely worth every minute. As a child, I usually just helped and watched, but this time, for the first time in my life I've decided to try to experiment with it myself. 1. Prepare dough: mix all ingredients (except blueberries) until soft and smooth (if too sticky add more flour). 2. Sprinkle flour on a pastry board to avoid the dough sticking to it. Roll up the dough on the table or pastry board, to a thickness of about 3 millimeters. 3. Cut circles in dough using glass rim. In the middle of each circle arrange a (table) spoon of blueberries, then fold the filled circles into half moons, sealing the edges and pressing shut with your finger. 4. 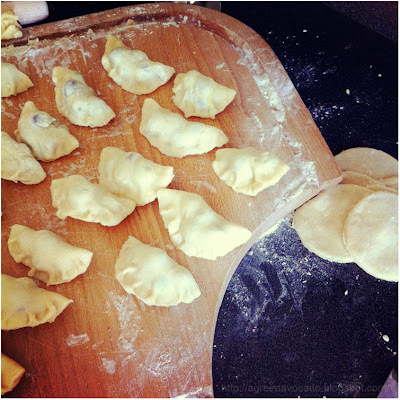 Bring a large shallow saute pan of water to a boil, add a spoon of oil (to prevent them from sticking together) and gently boil the pierogi in batches for 5-6 minutes (a couple of mins after they rise to the top of the surface), then remove carefully using a wooden spoon. Serve warm, sprinkle with some sugar and/or sour cream. I haven't found too many variations of the actual dough recipe, but maybe next time I'll experiment a bit adding some vanilla sugar to make it a bit more dessert-like. The batch of pierogi disappeared very quickly, I enjoyed it for dinner, a friend at work had it as a snack and there are some left for tomorrow's lunch. Definitely summer like! mam nadzieje Madziu ze juz sie udalo jagodowych sprobowac w tym roku. Jak lato to lato! Pozdrawiam! Pierogi w wersji letniej są absolutnie wspaniałe:) Z poziomkami najlepsze!